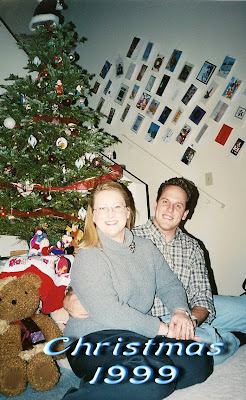 I'll lump these two years together because who really cares about Christmas photos before kids? I know I have some from 1996 and 1997, but I can't easily find them so you don't get to see them. We were younger, thinner, and I had much longer hair. At the end of 1997 I was in a pretty wicked car accident (a teen driver took his dad's car without permission and plowed into me) and 1998 was a year spent in physical therapy. I'd like to say that I totally recovered, but the sad truth that I don't like to dwell on is that every day since the accident is a day I have spent in pain. Some days are worse than others, and cold weather is worse than hot, so L.A. suits us fine. 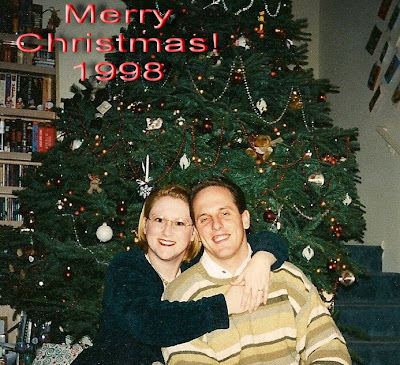 1999 was our last Christmas without kids! We actually went to the Rose Parade to ring in the New Millennium. We lived in Anaheim, CA where we both worked for Disney at the time. I resigned right after the new year and almost immediately found out we were expecting our first child!